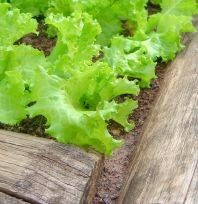 This method, one of the most common, is widely used for growing vegetables. It is very easy to perform and is particularly well suited to outdoor sowing , either in situ or in a nursery. A drill hoe or a triangle hoe is best to prepare the rows for your sowing. If you don’t have any, the round tip of any long-handled tool you happen to have is fine, too. 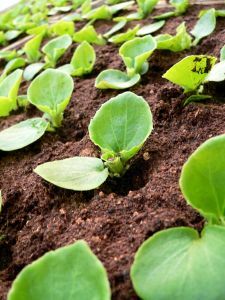 Row-sowing means to drop seeds, evenly-spaced, at the bottom of a furrow, the depth of which depends on the species you are going to grow. The depth ranges anywhere from ½ to 1 inch (3 cm). Usually you can estimate the depth to be 2 to 3 times the seed’s diameter. If you can, mark your rows following the direction of prevailing winds in your area. For smaller seeds, Nature-and-Garden recommends that you mix them with sand. 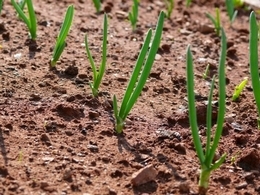 It will be much easier to spread them evenly without sowing too many in each furrow.